Strangely, ancient Israel had at least two “beginnings” to their year, one in Nisan (the spring) marked by Passover, and one in Tishri (the fall) marked by the Day of Atonement. Thus both beginnings were marked by blood ceremonies symbolizing the redemption of the people. Blood was (among other things) a sign of death. The blood rituals of Passover and Yom Kippur emphasized that “the wages of sin is death” (Rom 6:23). Why? Because the LORD is harsh and cruel? Not at all; in fact, quite to the contrary. The LORD is the source of life and all that is good. To turn away from Him is to turn away from life, which leads to death. Sin is turning away from Him. Therefore, to sin is to turn from life and choose death. The Passover Lamb had to be perfect: a type of the sinless Son of God, the “Lamb of God who takes away the sin of the world.” Curiously, the original Passover Lamb could be a young goat, but in time the tradition crystalized around a sheep. The Lamb had to be eaten by the family within a single house. The house in which the Lamb was eaten symbolized the unity of the family of God; in time, the Church Fathers would see the house as a type of the Catholic Church. Only that Eucharist (New Passover) was valid which was celebrated within the unity of the “one house,” the universal Church. The blood of the lamb—the sign of an atoning death for sin—marked the lintels and doorposts of each house, causing the Angel of Death to “pass over” the houses of the Israelites. But the Angel of death struck “down every firstborn of the land, both man and beast, and executing judgment on all the gods of Egypt.” Was God harsh in his judgment of the nation of Egypt, by striking down their firstborn? In evaluating that issue, we must keep in mind that the Egyptians had originally attempted to eliminate all the males of the Israelites (Ex 1:22). So God in his judgments is more merciful than man in his violence. Furthermore, the phrase “executing judgment on all the gods of Egypt” gives us a theological clue to understand the meaning of the Ten Plagues, of which Passover is the culmination. These plagues were ritual defeats of the Egyptian gods, starting with Hapi, the Nile God (ritually slain and turned to blood in the first plague), continuing with Hekhet, the frog-headed fertility god (mocked by an excessive plague of frog-fertility) and several others, and culminating with three days of “death” for Amon-Re, the sun god (the three days of darkness) and the death of the heir to the throne (during Passover), who was considered divine. In the process of the plagues, God was showing a certain severe mercy to the Egyptians, demonstrating to them that their gods were impotent and powerless before him, not true gods at all. The LORD God of Israel alone was creator and master of all other powers in the cosmos, whether natural or supernatural. The plagues were a sort of “power evangelism” of Egypt and the surrounding nations. Some of the Egyptians were, in fact, converted to the worship of the true God (Exod 9:20). The blood of the lamb was applied to the lintel and the door posts using a “bunch of hyssop” which was dipped in the blood (Exod 12:22). Hyssop was a Near Eastern plant with antiseptic properties. In John 19:29, a stalk of hyssop will be dipped in the “blood of the grape” and lifted to the lips of Jesus. The transept or cross-beam of the Lord’s cross forms a kind of “lintel” from which his body hangs. So the action at the cross, lifting the hyssop with the “blood of the grape” to the “lintel” of the cross is reminiscent of the Passover ceremony. The cross is stained with the blood of the True Lamb of God. The cross is the “door,” the portal of salvation. “No one comes to the father but by me” (John 14:6). “I am the door. If anyone enters by me, he will be saved” (John 10:9). It is only through Jesus—and through his cross, which requires the embrace of suffering—that we enter into salvation and union with God. R/. (cf. 1 Cor 10:16) Our blessing-cup is a communion with the Blood of Christ. R/. 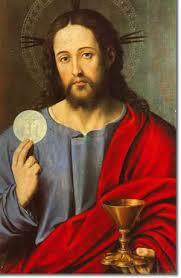 Our blessing-cup is a communion with the Blood of Christ. This Psalm is very rich in symbolism for the Holy Thursday liturgy. First, it is taken from the heart of the Jewish Hallel (“Praise!”), the set of Psalms (Pss 113-118) recited at the Jewish “Seder” or Passover meal. At the Seder, the Hallel is recited in two parts: first, Pss 113-114, a retrospective on the Exodus; then Pss 115-118, understood as a prospective of the final age of the Messiah. Psalm 116 is clearly a todah psalm, written to be recited during the performance of the todah (“thanksgiving”) sacrifice. The todah sacrifice was a certain kind of peace offering (see Lev. 7:11-15), and unlike other kinds of offering, it was not performed in atonement for sin or in reparation, but in thanks and praise to God for a specific act of deliverance. The todah was a festive occasion, because the sacrificial animal was eaten (rather than burnt up) along with many types of fine bread. The Rabbis classified the Passover as a kind of todah sacrifice, since it was offered in thanksgiving for the Exodus, and eaten rather than consumed in flame. Of course, we see great continuity here with the New Passover, the “Eucharist” (from Greek eucharisteo, “to give thanks”). The todah sacrifice is referred to in this psalm, when we say, “I will offer to you the sacrifice of thanksgiving.” In antiquity, this referred not a pseudo-sacrifice that consists only in thanking God through song (a common misconception), but a real animal sacrifice offered in gratitude for God’s saving act. Its contemporary analogue is not a non-sacramental “praise and worship” service, but the celebration of the Eucharist. From this Psalm we learn that it was common to offer a wine-libation as part of the todah ritual. This cup of wine, poured out (probably on the altar) in offering to God, is described in v. 13: “The cup of salvation I will take up.” Over this “cup of salvation” Jesus will later speak: “This cup is the new covenant in my blood” (Luke 22:20). In this Liturgy, we actually take the account of the Institution of the Eucharist from St. Paul in the Epistle Reading, rather than in the Gospel. St. Paul recalls that the Lord took bread and “gave thanks” (eucharisteo), then offered his body, and gave a command to “do this in remembrance of me.” The term “remembrance” here is full of liturgical connotation, because “remembrance” was a primary function of the liturgy. We recall that the original Passover was also instituted as a remembrance. The Israelites had an entire class of sacrificial offerings categorized as “remembrance” or “memorial” offerings.” Jesus is creating a new kind of “memorial” offering and commissioning his disciples as the priest who will celebrate it. The Lord speaks over the cup: “this is the new covenant in my blood,” that is, “consisting of my blood.” This phrase draws on many important concepts from the Scriptures of Israel. First, Jesus is indicating a fulfillment of Jeremiah 31:31, the famous prophecy of a coming “new covenant”; indeed, the only passage of the Old Testament that uses the exact phrase “new covenant.” This new covenant consists of Jesus’ blood, which makes sense because a covenant extended kinship (i.e. blood relations) between parties. 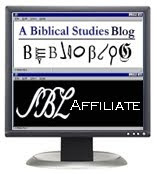 We who partake are now “blood relatives” of Jesus. And since “the life is in the blood” (Lev 17:11), we now share in the divine life. By giving his body and blood as the “new covenant,” Jesus fulfills Isaiah 42:6 and 49:8, which prophesied that the servant of the LORD would not merely make a covenant but become one. Finally, the “new covenant in my blood” recalls Moses “blood of the covenant” (Exod 24:8) at Mt. Sinai, which formed the twelve tribes into the family of God. Now Jesus renews and transforms that divine covenant, only with the twelve apostles on Mt. Zion. Interestingly, Evangelical scholar Richard Averbeck argues that the originally the blood ceremony at Sinai not only established the covenant but also consecrated the people as royal priests (cf. Exod 19:5-6). If we see the parallel between Moses and the twelve tribes on Mt. Sinai in Exod 24:8, where Moses speaks of “the blood of the covenant”, and Jesus and the twelve apostles on Mt. Zion in Matt 26:28, where Jesus speaks of “my blood of the covenant,” then we could also draw the conclusion that the Last Supper was also a kind of ordination/consecration of the Apostles as priests of the New Covenant. Many have noted the irony that, on the Mass of the Lord’s Supper, we read from the one Gospel that does not have an account of the Lord’s Supper or the institution of the Eucharist. John chooses not to tell that story again (you’ve heard it four other places in the New Testament already: Matthew, Mark, Luke, and 1 Corinthians). Instead, he focuses on the foot washing prior to the Supper. The foot washing has several levels of symbolism. Jesus disrobing, washing the feet, dressing again, and sitting down once more are a parable of (1) the sequence of his incarnation–life–death–ascension, in which he took off the garments of his visible divinity, became humiliated, and then was clothed once more in glory, and also (2) his passion–death–resurrection, in which he takes of the garment of his humanity, descends to death, and takes up his human “garment” once more, now glorified. The account of the foot-washing is theologically analogous to the great hymn of Phil. 2:5-11, which we read on Palm Sunday. The foot-washing itself was a humble act of service on Jesus’ part, and almost everyone perceives the basic message of the act: we also should be willing to humble ourselves in concrete acts of service to others. However, there is also a sacramental level of meaning: priests had to wash their feet and hands before entering the sanctuary to offer sacrifice (Ex 30:19,21). The disciples have washed their hands, but not their feet: Jesus completes a figurative “ordination” for them, for he intends them to be the priests of the new covenant who will celebrate the New Passover sacrifice for God’s people. Jesus and Peter get into a discussion of “having a part in me.” The Greek term for “part” (meris) is full of priestly connotations: the Levitical priesthood had no “part” (meris) of the land, because their sole “part” or “portion” was the LORD himself (Num 18:8). Thus, the disciples are to become like the Levitical priesthood of old: their sole “portion” in this life is Lord. Although this principle does not demand celibacy of the new covenant priesthood per se, we can see how the celibate life of the Latin priesthood is a beautiful expression of the truth that the LORD and he alone is the portion and inheritance of those who take Holy Orders. It is legitimate to see in Jesus’ expression “he who has bathed” a reference to Baptism, and therefore the “washing of feet” would indicate a post-Baptismal removal of sin, i.e. the Sacrament of Confession. Thus, “wash one another’s feet” has several layers of meaning: (1) “perform humble acts of service to one another,” (2) “forgive each other’s sin” in a simple sense (3) “forgive each other’s sin sacramentally,” i.e. hear each other’s confessions. The foot washing rite was not traditional in parish life in the Latin Church prior to Vatican II, but was instituted as an option by the Council. It has since become popular. The rite was intended to re-enact the foot-washing of the apostles as part of their ordination as the priesthood of the New Covenant. To represent the priestly college, the rite originally prescribed that men (viri) were to have their feet washed. However, in many places the connection between the rite and the ordination of the New Covenant priesthood was not recognized, and it was understood only in terms of Christ’s humility in coming to serve the entire people of God. And indeed, the Twelve do mystically represent the whole people of God. Some years ago, Pope Francis changed the instructions on the rite to make licit what had been common practice in many places for some time, and now persons of any age or gender may have their feet washed in the rite. This changes its meaning somewhat, and excludes the connection to the ordination of the ministerial priesthood. Now, the meaning rite is primarily as a symbolic sign of Christ’s humble service to all the people of God. Be that as it may, the celebration of Institution of the Eucharist on this holy night necessarily causes us to meditate on the gift of Holy Orders, without which the Eucharist would not be available to us. Thus, this great celebration of the Mass of the Lord’s Supper motivates us to appreciate and value three interlinked sacraments of the Church: Eucharist, Holy Orders, and Reconciliation. We could also add Baptism in the mix, because the washing of the feet also recalls how Jesus has already washed us all in the “bath” that he mentions to Peter. Jesus has done everything for us: descended to save us, washed us in the Holy Spirit, fed us with his own body, anointed us with the oil of the Spirit. This liturgy should fill us with gratitude as we ponder the great things God has done for us in Christ, and should cause us to renew our efforts to show love to those around us, sharing with them all the undeserved blessing that Jesus has poured out on us.